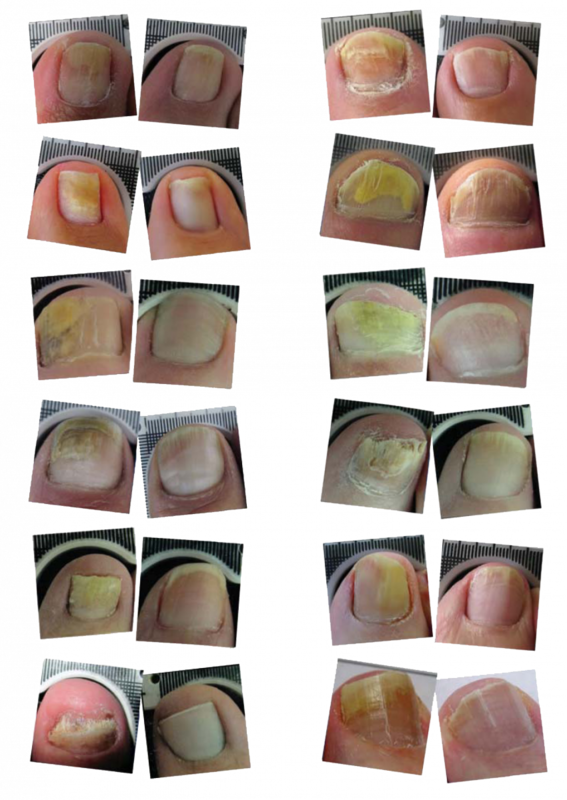 ARE YOUR DISCOLOURED, THICK AND DISFIGURED NAILS CAUSING YOU DISCOMFORT AND EMBARRASSMENT? YOU MAY HAVE A FUNGAL NAIL INFECTION CALLED ONYCHOMYCOSIS. THE LUNULA LASER MAY DO WONDERS FOR YOU. OUR FOOT CLINIC HAS INVESTED IN THE LUNULA LASER FOR THE TREATMENT OF FUNGAL TOENAILS. WHAT SETS THIS LASER APART IS THAT IT IS A MOST EFFECTIVE AND SPECIALIZED TREATMENT FOR COMBATING FUNGAL INFECTIONS. THE LUNULA LASER IS A COLD LASER SO IT’S 100% PAIN FREE. THE LASER IS COMPUTER AUTOMATED TO ENSURE CONSISTENCY OF COVERAGE OF THE NAIL WHICH IS A NEW FEATURE. COLD LASER IS SUPERIOR TO HOT LASER SYSTEMS AND THERE’S ALSO A HIGHER SUCCESS RATE THAN CONVENTIONAL TREATMENTS WITH NO RECOVERY PERIOD AFTER TREATMENT. YOU CAN WEAR SOCKS AND SHOES IMMEDIATELY AFTER TREATMENT AND WALK NORMALLY. THE LUNULA LASER RECEIVED FDA – CLEARANCE AND IS ALSO HEALTH CANADA APPROVED. THE LASER IS AN ALTERNATIVE TO TOPICAL MEDICATIONS WHICH HAVE LIMITED EFFICIENCY, AND ORAL ANTIFUNGAL PILLS SUCH AS LAMISIL WHICH HAVE ASSOCIATED POTENTIAL SERIOUS SIDE EFFECTS SUCH AS LIVER DAMAGE. HOW DOES THE LUNULA LASER WORK? LUNULA LASER IS A DUAL-DIODE, LOW LEVEL LASER DEVICE THAT DELIVERS A MULTIFACETED TREATMENT FOR ONYCHOMYCOSIS. LUNULA LASER FOLLOWS THE PRINCIPLES OF PHOTOCHEMISTRY, A SCIENCE THAT EXPLORES LIGHT’S EFFECT ON CELL FUNCTION AND BEHAVIOR. THE PHOTOCHEMICAL MECHANISM ENABLES LUNULA LASER TO GIVE A DIRECT, NON-CONTACT TREATMENT THAT PRODUCES NO MACROSCOPIC SENSATION: NO HEATING, TINGLING OR BURNING. THE MECHANISM OF PHOTOCHEMISTRY IS LIKENED TO THE AGONIST EFFECT OF A DRUG, WHICH DESCRIBES THE USE OF A CERTAIN MOLECULE TO START A SECONDARY CASCADE. LASER THERAPY USES PHOTONIC ENERGY TO MODULATE SECONDARY CELLULAR REACTIONS WITHOUT THE PATIENT FEELING THE DEVICE WORKING. LUNULA LASER’S IMPRESSIVE CLINICAL RESPONSE STEMS FROM ITS TWO THERAPEUTIC WAVELENGTHS: 405 nm (VIOLET) AND 635 nm (RED). EACH WAVELENGTH PERFORMS A VERY SPECIFIC FUNCTION TO PROVIDE A COMPREHENSIVE TREATMENT FOR FUNGAL NAILS. THE MANNER IN WHICH THE WAVELENGTHS ARE DELIVERED REPRESENTS AN INNOVATIVE AND PROPRIETARY FEATURE OF LUNULA LASER. LUNULA ADMINISTERS THE LASER AS A LINE-GENERATED BEAM, WHICH MAXIMIZES THE TREATMENT SURFACE AREA. THE FUNGAL PATHOGEN MAY NOT ONLY AFFECT MULTIPLE TOES, BUT ALSO MAY BE FOUND DEEP WITHIN A DYSTROPHIC NAIL OR ALONG THE NAIL BED AND ROOT. THE LINE-GENERATED BEAM ENSURES THAT,REGARDLESS OF WHERE THE FUNGAL PATHOGEN RESIDES, AN EFFECTIVE TREATMENT WILL BE ADMINISTERED. It is estimated that up to 12% of Canadians are affected by toenail fungus. Nail fungus is made up of tiny organisms that infect and grow under the nails, as the space under the nails provides a good environment for the fungus to grow. An injury to the toenail from tight shoes or damage from dropping a heavy object on a toe can lead to a fungus infection as the injury can cause the nailplate to separate from the nail bed. This separation creates an ideal place for the fungus to start growing. Nail fungus is most commonly found in the toenails because the socks and shoes we wear provide a dark, warm and moist place that is suitable for fungal growth. Fungus initially starts out as a small yellow or white spot or streak on the nail and if left untreated can potentially infect the entire nail and can also spread from toenail to toenail and from person to person. In 10% of people it can affect the fingernails. People who are elderly or who have poor health. People who go barefoot in public places such as public showers, gyms and swimming pools. People that get pedicures in spas that don’t sterilize their instrument or use nail polishes on multiple clients. People that have a history of fungal skin infections of the feet (athletes foot). People who have hot, sweaty or moist feet. Generally fungal infections of the toenails cause the toenails to become thick, flaky and turn yellow, white or brown. Fungal toenails will often have a foul smell and will generally accumulate debris under the nail. In severe cases the nail can separate from the nail bed and fall off. Am I a good candidate for laser fungal nail treatment? How long does the laser treatment take and how many treatments will I need? A laser treatment takes 12 minutes per foot. How many treatments you need depends on how severe your infection is. If there is less than 50% involvement of the nail then you will need one treatment per week for 4 weeks. If there is 50%-75% of nail involvement you will need one treatment per week for 4 weeks take a months break and then another treatment per week for 2 weeks. If there is 75%-100% of nail involvement you will need one treatment per week for 4 weeks take a month break and then another treatment per week for 2 weeks another month break and finally another treatment per week for 2 weeks. The laser provides a comfortable, safe, pain free treatment. Will I be able to walk after my laser toenail treatment? Yes you will be able to walk and resume regular activities right away after the treatment. Is laser toenail treatment safe and are there any side effects? The studies undertaken so far show that the treatment is absolutely safe and has no side effects. Does laser toenail treatment work? Yes. However there can be factors affecting the degree of response to treatment such as a history of trauma to the nail, long standing severe infection of the nailplate and nailbed, or a compromised immune system. How soon will I see results after my toenail laser treatment? On average, a toenail will replace itself every 9 -12 months. Healthy new nail growth will be visible within the first 3 to 4 months as your nail continues to grow following the laser treatment. However many people will notice changes in the nail much earlier than that. Does the laser toenail treatment permanently cure my fungus? Fungus is an opportunistic organism. In other words it is always around us in our environment and if the right conditions are available (warmth and moisture) it may grow. The procedure will treat the infection you currently have but will not prevent you from getting it again in the future. You will need to take precautions in the future to prevent recurrences. Wear flip flops or rubber sandals when you use public facilities such as gym showers, change rooms and swimming pools. Nail fungus is contagious and someone with an infection may have walked in the area before you. Wear shoes that fit properly and don’t pinch your toes. Damaged toenails provide a good place for fungus to grow. As part of the treatment plan we highly recommend the use of a topical antifungal agent to prevent cross contamination and the use of an antifungal shoe spray to reduce the risk of recontamination. In our office we recommend Formula 3 topical antifungal drops and Clean Sweep shoe spray. Avoid using the same shoes everyday to give them time to air dry especially if you sweat a lot. If you sweat excessively change your socks a couple of times a day. If you have skin fungus, before bed thoroughly wash and dry your feet especially between the toes, and apply an antifungal cream to the entire foot. Use the cream every night, then gradually apply it less often. Do not cover up an existing nail fungus with nail polish for longer than a week. Ignoring the fungus will only give it more time to get worse. If you get a pedicure or manicure from a salon or spa make sure they sterilize their instruments after every customer. Sterilization liquids alone are not adequate. They should be using steam sterilizers. Alternately, you could purchase your own set of foot care instruments and bring your own nail polish to the salon. See a chiropodist if you suspect you have an infection. Early treatment of fungus is critical. KNOW WHAT IS CAUSING YOUR DEFORMED NAILS. IN OUR CLINIC WHENEVER POSSIBLE WE CHECK FOR FUNGUS OF THE NAILS BY TAKING CLIPPINGS OF THE NAILS AND PLACING THEM IN A DERMATOPHYTE TEST MEDIA TO CONFIRM THE DIAGNOSIS. FIND OUT THE BEST TIPS TO MANAGE YOUR NAILS AND HELP YOU TOWARDS HEALTHIER LOOKING NAILS. LEAVE THE APPOINTMENT WITH CONFIDENCE KNOWING EXACTLY WHAT TO DO TO HAVE HEALTHIER NAILS.